Neil Kinder, CEO Kinder Australia, explains: “The spotlight is often turned onto maximising performance during these periods of production down-time. In reality, paying time and attention to improving and maximising the effective performance of a plant’s conveyor system can have many long lasting positive profitability and productivity benefits”. “A critical element of an effective conveyor system is the Transfer Point”, says Kinder. “By closely identifying, evaluating and optimising existing belt loading, handling plants can reduce many unpleasant on-site issues mentioned earlier, plus address safety issues of dust emissions. This process all leads to improving and extending the service life of the conveyor belt”, adds Kinder. The company’s quarry customer in Ormeau, Queensland, sees production capacity at approximately 400 000 tpy and is involved with handling greywacke with gritty characteristics. The weight pressure of the transferred material loading was causing major conveyor belt sagging issues between the supporting rollers. Belt edge sag allowed the tendency for material to spill through the gaps between the skirting and conveyor belt, general material spillage was also an area for rectification. Small rocks present also had the potential to get caught between the conveyor belt and the skirting, causing premature groove lines on the conveyor belt’s top cover. 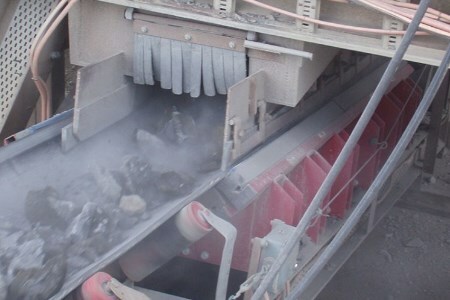 The quarry addressed the ongoing belt sag issues by installing K-Sure® Belt Support System which helped to control dust emissions and material spillage. The recommended belt support system successfully provided even and consistent support under the belt, utilising low friction UHMWPE slide surface bars instead of rollers. With no moving parts, there were no requirements for replacing rollers in the foreseeable future. Similarly, maintenance teams at a quarry customer in Victoria reported issues with damaging dust emissions. The transfer point under the tertiary crusher was a source of constant, excessive material spillage and dust emission. Material turbulence generating huge amounts of dust in the tertiary crushing process was ultimately escaping and causing significant emissions from the conveyor belt skirting system. “The quarry maintenance team followed Kinder Australia’s recommendation to overhaul the conveyor system by fabricating a new tail section and install K-Impact Belt Support, K-Sure Belt Support System and K-Ultra Dual® Seal Skirting System”, says Kinder. Kinder also highlighted “K-Impact Belt Support modular system installation was very successful in stabilising the load at the transfer point which in turn improved material containment, additional maintenance and labour costs were also averted”. It’s well regarded that transfer points are instrumental for conveyor belt systems running efficiently, integral to this is incorporating an exceptionally designed and executed transfer chute. “The key to measuring efficiency of transfer points involves the requirement for maintenance teams to continually monitor and assess the conveyor system both before and after the load transfer point and make any necessary adjustments”, says Kinder. Recent additions to Kinder Australia’s product line up include K-Dynamic Belt Support and K-Flexal® Elastic Belt Support System, both engineered and designed to allow better absorption of energy and provide an even weight dispersion of the conveyed bulk material. Additional cost advantages are also realised, such as improved wear life of the conveyor belt and components and reduction in conveyor belt maintenance costs, which can assist quarry operational bottom line.